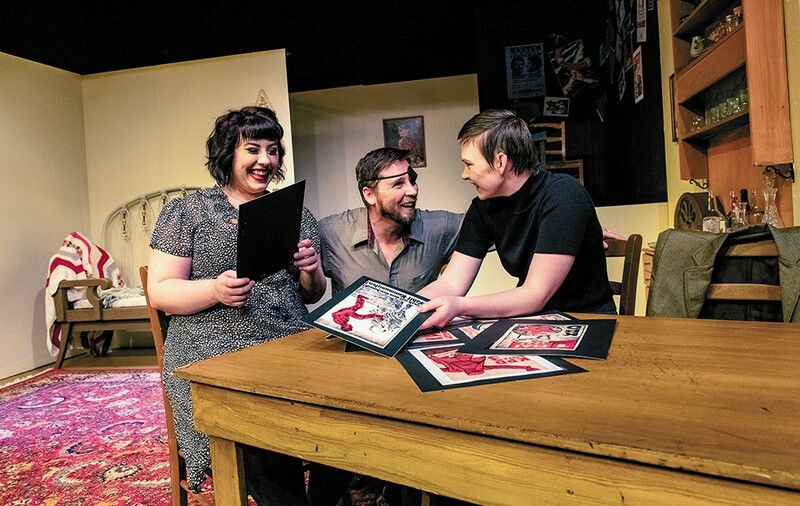 FROM LEFT: Christine Mullaly, Scott Doughty and Harper Clanton perform in A Bright Room Called Day at Stage Left. There's an allegory, often invoked for rhetorical effect, about a frog in a pot of water. As the pot is slowly heated, the frog instinctively acclimates itself to the increasing warmth of its environment. Eventually, though, the water reaches boiling point, and the unwitting frog becomes soup. The point of the allegory is to warn against the dangers of inaction in the face of incremental negative change. Its premise is echoed in the familiar (and frequently misappropriated) poem by the Lutheran pastor Martin Niemöller, "First They Came...," which was an attempt to illustrate the Nazis' systematic aggrandizement of power under Adolf Hitler during the 1930s. First they purged one group. Then another. Then another. And each time it was explained, excused, normalized, until an entire continent was boiled alive. Tony Kushner's A Bright Room Called Day, written only a few years before the playwright found success with Angels in America, could be seen as a loose dramatization of Niemöller's poem. It's set in an apartment that drifts between Berlin, Germany, during the rise of Nazism and Long Island, New York, a half-century later during the early years of the Reagan administration. In the 1980s, the apartment is occupied by a woman named Zillah, who's outraged by the president's indifference to the AIDS crisis. In the 1930s, it's inhabited by Agnes Eggling, an aging actress who entertains a bohemian set of artists and would-be revolutionaries who are unsettled by the turbulent collapse of the Weimar Republic. Lindsay Teter is directing a new production of A Bright Room Called Day for Stage Left. 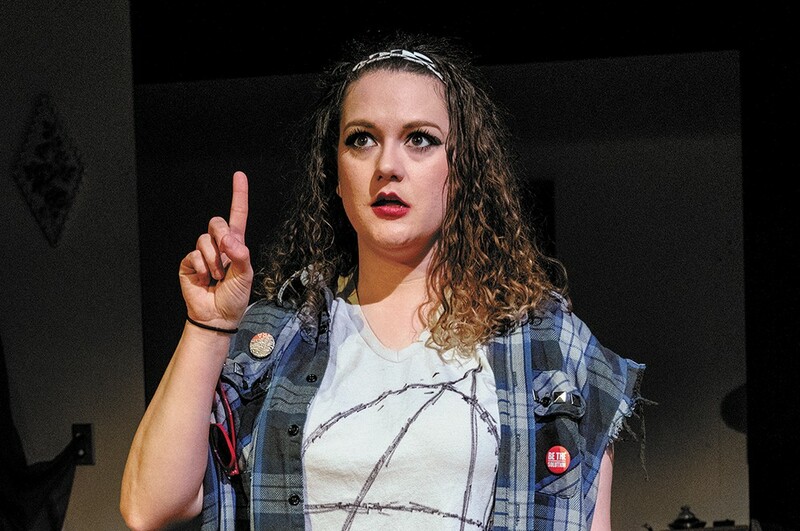 Although she's previously appeared on the theater's stage for productions of God's Country and Cyrano, it's her first time directing a non-collegiate show. "The biggest difference I've noticed is my cast," she says. "I've been so lucky to have a professional-level cast with lots of years of experience and a lot of training. So, walking in, I didn't have the same responsibility to explain some of the ground rules. It's just jump right in and get started." That 10-person cast includes Christine Mullaly (Agnes), Dalin Tipton (hedonistic "Baz" Bazwald), Scott Doughty (Hungarian filmmaker Vealtninc Husz), Tami Rotchford (Paulinka Erdnuss, a rival actress to Agnes) and Harper Clanton (painter Annabella Gotchling). The play's struggles between activism and acquiescence unfold through their conversation. "Two of my male leads, Scott Doughty and Dalin Tipton, both very seasoned actors, have an ability to know when to take up the space and become a commanding presence, and they also have this chameleonic ability to disappear while still being onstage. It's all about knowing how to draw the focus. We do have some younger, greener actors, too, and it's been such a fun process watching them learn these techniques." As a result of some "cast shifting," Mullaly was brought on slightly later than the others. She'd been away from the stage for some time but arrived, Teter says, with a "nose-to-the-grindstone commitment" and some valuable ideas about how she should approach her role. As did the rest of the cast. Katie Pease as Reagan-era Zillah. "Coming in, I lived with these characters in my head for six months, so I thought I had a really clear idea of who they were. And within a week of getting the cast around the table, just reading the show and discussing things, they were able to completely change so many ideas. I watched them imbue these people with a real humanity and a playfulness that I wasn't expecting," she says. Zillah, who serves as a link between past and present, is played by Katie Pease. Teter acknowledges that the character's alarmism over Ronald Reagan could seem overblown in retrospect, but she resisted the temptation to update. She felt that drawing more contemporary parallels might create a "lit match" and "spark controversy rather than conversation." "With the character Zillah, who's speaking from the Reagan era, you've got a person who's living in the moment. In 2019, we could look back and say, OK, that's a bit of a stretch. We certainly didn't reach these sorts of lows.' But during that time, that fear was of course so very palpable, and I didn't want to dismiss that. I wanted to have that fear and uncertainty be just as fresh for Zillah as it is for our characters going through the world of the 1930s." Keeping Zillah rooted in the 1980s was also a way to create another point on a longer timeline that extends to the present day. The original print version of this article was headlined "Historical Slacktivism"